GoLive Indonesia collaborated with PPIA The University of Adelaide and LPDP (Indonesia Endowment Fund for Education) South Australia community in September discussion series on 26 September 2017. The discussion series highlighted on patent awarded research in Indonesia and was held in Rumours Café, The University of Adelaide. The discussion went for 90 minutes followed by welcoming event for new students hosted by LPDP South Australia community. The session begins with warm greetings from GoLive Indonesia Coordinator, Indra Kiling and also by President of PPIA The University of Adelaide, Muhamad Bai’ul Hak. Edy Purwanto, today’s speaker is a current PhD student in The University of Adelaide, with expertise in chemical engineering field. He is currently granted a patent from Indonesian Government for synthesis of biodiesel through simultaneous reactions ozonolysis and transesterification. The discussion was moderated by Anne Romea, a new student in The University of Adelaide whom also a GoLive Indonesia volunteer. He began the presentation with explaining definition of patent and invention, highlighting the differences on both concepts. He continued with elaborating the differences between patent and simple patent, breaking down characteristic of both, and also encouraging the attendees that a person doesn’t have to study science or have higher degrees of research to create a new invention. For examples of simple patent, he provided pictures of paper clip, ring-pull cans, aircraft seat buckle, and post-it notes. He mentioned that invention products are not necessarily sophisticated, and most of the times they are just simple things we encountered in our daily life. He continued with explication on the process of designing research that could produce new invention that’s patentable, before sharing his research and the journey of obtaining his patent. His presentation concluded after 45 minutes long and continued with question and answer session. As many as 15 persons were immersed in the discussion involving questions concerning the property rights of batik, tempeh, cost of applying a patent, royalties associated with patent, and administration procedures concerning patent. The session then concluded with handing of certificate by Khusaini, lurah (head) of LPDP South Australia community to Edy, and a photo session. The morning then continues with a welcoming event for new students hosted by LPDP South Australia community. Leaders from several communities in South Australia gave welcoming speech such as Khusaini, Iwan Tirta as lurah of Spirit scholarship community, Michael Patrick as President of Australia Indonesia Youth Association-South Australia chapter, Soni Ariawan as secretary of MIIAS (Indonesian Islamic Society of South Australia), Bara Asyrof as representative of Rebana community, and Mada as head of Pri Muhammadiyah Adelaide. The long morning then ended with lunch prepared and brought by all the attendees. GoLive Indonesia would like to thank Edy Purwanto as the speaker and Anne Romea as moderator and highly appreciates the collaboration opportunity provided by PPIA The University of Adelaide and LPDP South Australia community in this event. We have a lot of discussion on socio-humaniora topics lately, leaving question marks on our science researchers. 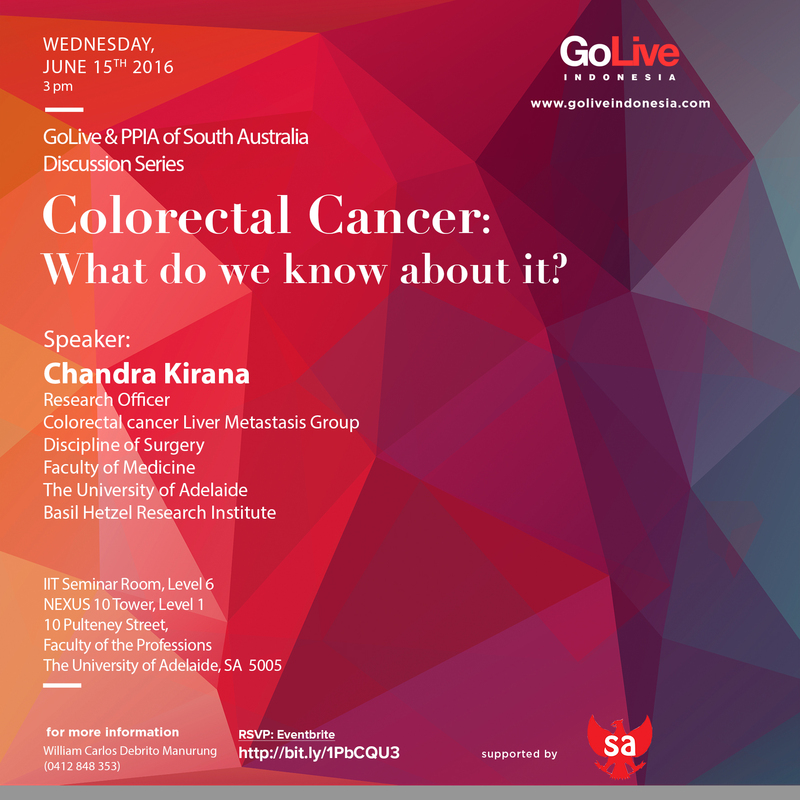 This time a collaboration of GoLive Indonesia, LPDP South Australia and PPIA The University of Adelaide will bring to you an answer to that. Edy Purwanto, a PhD candidate in The University of Adelaide who recently received a patent for his research in Indonesia, will share with us his experience and research! Everyone is invited, discussion will be in English, and lunch will be provided. Share plate welcome. GoLive Indonesia is back with their first discussion series on March 10, 2017. The first discussion series of 2017 talks about “Scholarship in Australia and future alumni collaboration”. The discussion series was held at 715 Conference room, Ingkarni Wardli Building, North Terrace Campus, The University of Adelaide. The discussion goes for 3 hours and separated into 3 sessions, the 3-possible way to get a scholarship in Australia, how to submit an application to an Australian university, and possible alumni collaborations and contributions. The discussion series is followed by a lunch networking session hosted by the School of Psychology, Faculty of Sciences, The University of Adelaide. The session begins with warm greetings from GoLive Indonesia coordinator, Gracia Girsang. Followed with elaboration on LPDP scholarship from Yanuar Syapaat and Indra Kiling. Both speakers share some tips and tricks on how to get LPDP scholarship; where some of the important points are the return agreement requirements, age limit, and to provide and prepare thoroughly particularly when the course you desire is not on the scholarship provider’s priority. Indra Kiling deliberately gave himself a bit of pressure by delaying his LPDP application to stimulate productivity. Then, the explanation on AAS (Australian Awards) scholarship, were presented by Kristin Ramlan and Ari Arifin. Both speakers emphasize that future applicants need to choose the most suitable awards option for themselves – either short or long-term awards -, check discussion forum for first-hand experiences and make sure their IELTS score is sufficient, and carefully prepare for the interview. This session is closed with Aryani Tri Wrastari’s descriptions on Endeavour Scholarship. Aryani explains 9 crucial tips in completing your Endeavour application. She emphasizes that it’s not about your major or your age is within the limit, it is more towards you showing your achievement and experiences that particularly highlights your networks, partnerships, and collaborations. The second session begins straight after the other one, highlighting information on how to apply to an Australian university. This session were led by Indra Kiling and Gracia Girsang. This session encourages future students to gather information and research from available university websites and publication in relation to finding the right supervisor for their research topic. By doing so, students will be able to capture the supervisor’s interest towards their research topic and gain their support. Gracia then continues the session by providing an example of how to construct a research proposal. She highlights that in writing the research proposal, future research candidates need to be concise and flexible. A well-written proposal with around 1000-1500 words would be sufficient to get the attention of potential supervisors. After a short break, the last session wraps up the discussion series by encouraging current and future students to contribution and to give back to their country. Margaretha, one of the panelists in Session three, reiterated that by utilising the beauty of networking, we can join a community and get involved and work towards giving back to Indonesia. One of the attendees, Enceria Damanik, underlines how educated Indonesian students and graduates studying abroad are greatly appreciated and that Indonesia is very much looking forward to their return. Some of the Indonesian participants currently studying at the School of Education under the Australia Awards Indonesia Short Course program then join the School of Psychology for a lunch networking event. They were greeted by Professor Anna Chur-Hansen, Head of School of Psychology, Professor Deborah Turnbull, and Professor Nick Burns, also from the School of Psychology. Introduction to the School of Psychology and its research focus area were provided by Prof. Anna Chur-Hansen. Continued with an opportunity for some of the students to share their research interest and possibility of pursuing a research degree at the school. This session is filled with enthusiasm and dynamic discussion about the students’ research topics and how to pursue it. The lunch session concluded with a group photo and excited potential higher degree research students. GoLive Indonesia would like to thank all the speakers and highly appreciates the support given by the School of Education and the School of Psychology, the University of Adelaide for this event. Also Swisin Budiman, GoLive Indonesia enthusiast for the highlights. We would like to wish every participant the best for their scholarships application and looking forward to their contribution to the development of Indonesia. Photos courtesy of Vidi Valianto. GoLive Indonesia proudly presents our monthly Discussion Series. This October, we will focus on environmental sustainability with speakers from University of Adelaide and University of South Australia. Come along and see if you can tell the difference between palm oil and oil palm and the latest production application used by palm industries. RSVP via this link . Talking about cancer can be daunting for most people. However, not the case with GoLive Indonesia discussion series. This month, GoLive Indonesia is grateful to have Dr Chandra Kirana, Research Officer at Basil Hetzel Research Institute, Faculty of Medicine at the University of Adelaide, as our presenter. Dr Chandra got her degree as a Biologist from Gadjah Mada University and completed her PhD at the University of Adelaide and worked at CSIRO Human Nutrition in Adelaide and Wakefield Biomedical Research Institute in Wellington in New Zealand. The discussion on colorectal cancer (CRC) highlights on how this particular type of cancer is usually found in older generation and developed countries, while increasing trend is also found in developing countries. In the case of Indonesia, Dr Chandra elaborates that there is still very little research being done on CRC. Furthermore, she enunciates previous research which found that the risk of getting cancer due to genetic history is only at the 10% level. The way we treat our body, what we eat and what kind of lifestyle we choose pose a greater 30% cancer risk. Similarly, what we do to the environment (pollution, drinking water) and virus or bacterial infestation expose 30% each of cancer risk to humans. While talking about CRC prevention and detection, Dr Chandra explains how Australian Government set up a program that automatically ask permanent resident and citizen at the age of 50 to send their stool sample for a faecal occult blood test as CRC screening. When dealing with cancer, samples, data and early detection mechanism is imperative. Our discussion then establish that high fibre diet is extremely important in staying healthy. When asked about Indonesian cuisine, Dr Chandra describes that Indonesian’s diet is rich of fibre, especially our green vegetables. In addition to that, she also emphasizes on the benefit of having turmeric as part of our diet. Research shows that turmeric contains good anti-cancer properties. Also soursop leaves is recommended for prostate cancer patients. The ninety minutes discussion went by swiftly. It is intellectually stimulating to learn that when talking about cancer, the amount of research, resources and factors involved to find a cure is ample. Biologist like Dr Chandra represents a small side of the struggle to overcome CRC. Information about cancer alone is often found lacking, this is where Dr Chandra emphasize on the importance of a collaborative effort in research and hope that Indonesia will be able to keep up with the challenge. GoLive Indonesia is deeply thankful to Dr Chandra Kirana for sharing her knowledge with us. Photos courtesy of Reyza Ramadhan. GoLive Indonesia cordially invites you to our June discussion series. 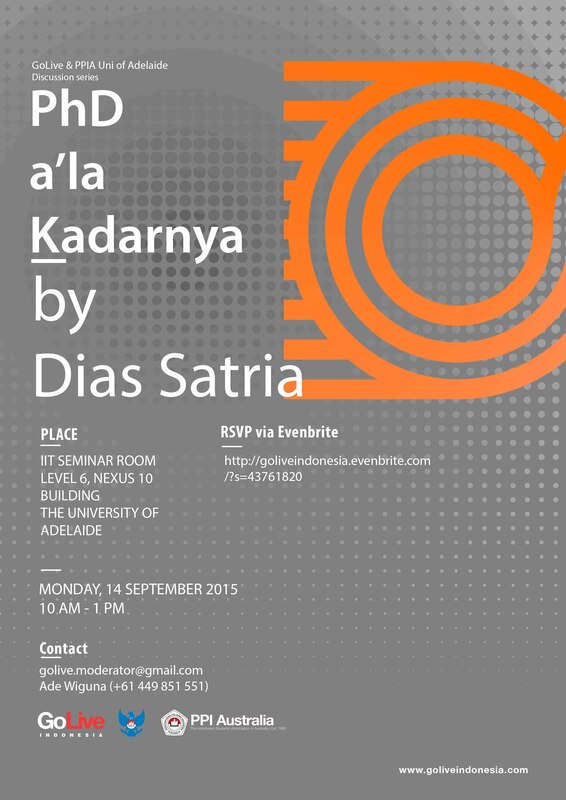 GoLive Indonesia Discussion Series is back on Monday, 14 September2015 at 10 AM, featuring our former GoLive enthusiast Dias Satria.